Our dedication to protecting our homeland Africa and its resources is at the heart of our culture. It is for this reason that we use materials that are obtained fairly, responsibly and are environment friendly. made of brass, silver, various types of glass, shells and stones. We use recycled glass,dried seeds,Ostrich shell beads,horn and Cow bone beads in a variety of our necklaces. These beads are locally made in Nairobi. child,therefore we train young girls jewelry making through apprenticeship. To view our products please log onto http://www.etsy.com/shop/lukagwa. Beads are an integral part of the African history and culture.They were used as a status symbol,adornment and gift. 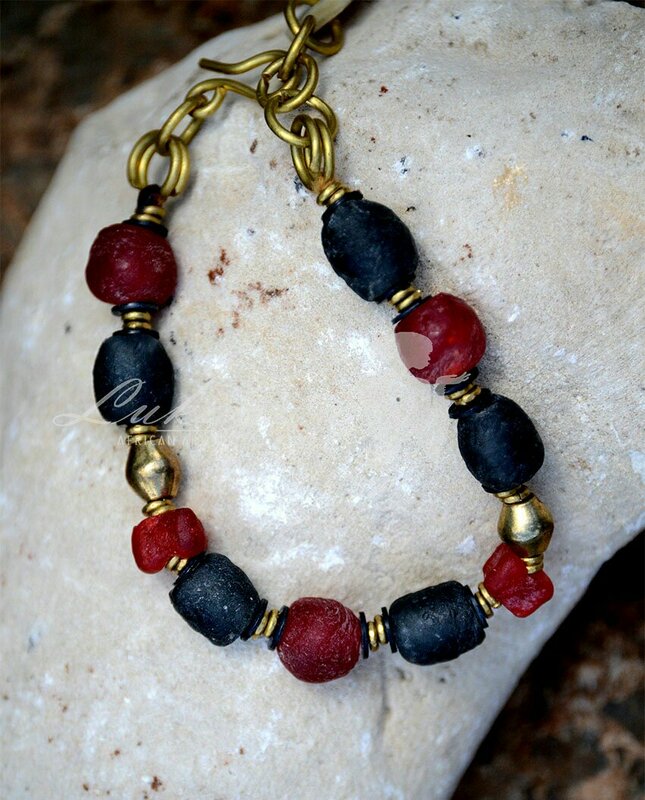 These attractive beads are made of plastic and glass that the Maasai obtained from other communities through trade. Before that the Maasai used wood,iron, seeds and shells as materials to make their traditional ornaments. Making jewelry is done specifically by women and it’s considered their duty to learn bead work. 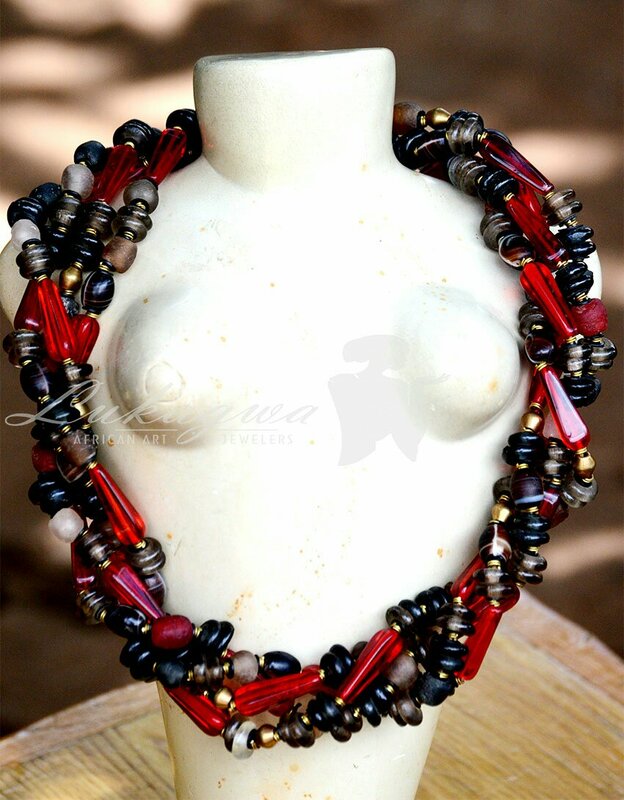 In the pastoral communities beaded necklaces were used to indicate the status of one in society.A young unmarried Samburu lady would wear a series of beaded necklaces, which have been given to her as gifts.These beaded necklaces would make her desirable thus securing a marriage proposal. Amongst the Kikuyu a circumcised man would wear a beaded belt known as Kenyatta until he became an elder.In South Africa the Zulu used specific color of the beads to convey a message to their suitor. They are a major feature during many traditional festivals during which devotees and participants decorate their bodies with beads of different shapes, colours and sizes. Glass Beads were also one of the products traded, in exchange for humans between Europeans and West Africans in the Trans Atlantic Slave Trade era. Later beads signified royalty and distinguished a royal father from his subjects, chieftain title holders and other monarchs always wore beads.Glass beads in Africa are mostly made by the Bida of Nigeria, Krobo of Ghana and Baoule of Cote d’Ivoire. Cowrie shells are valued for their durability and aesthetics.They were once used as burial offerings and symbolize fertility. It is believed that cowrie shells were the first currency used by mankind. In Ancient Africa they represented wealth and were traded for food,goods and services. They were mostly sourced from India.Nowadays they are used in ornaments and numerous decorations. 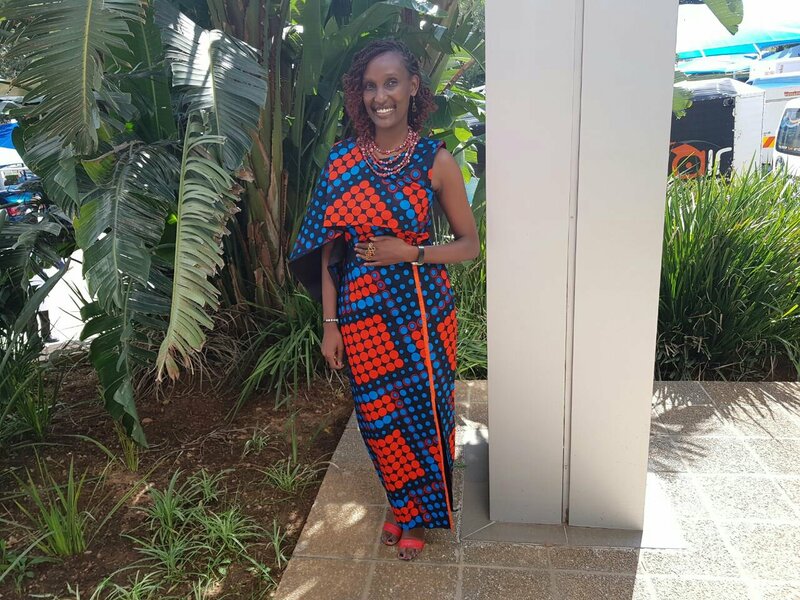 Our favorite photo Last month was from our customer who rocked our red layered necklace and Brass ring alongside her African outfit. We also featured #rededition collection of necklace and matching bracelets because who doesn’t love a little color coordinated elegance. These delectable Brass rings are sure to make the difference in your outfit.Head over to our Etsy store and make your pick before stocks run out. People do notice rings, even if they do not say anything. 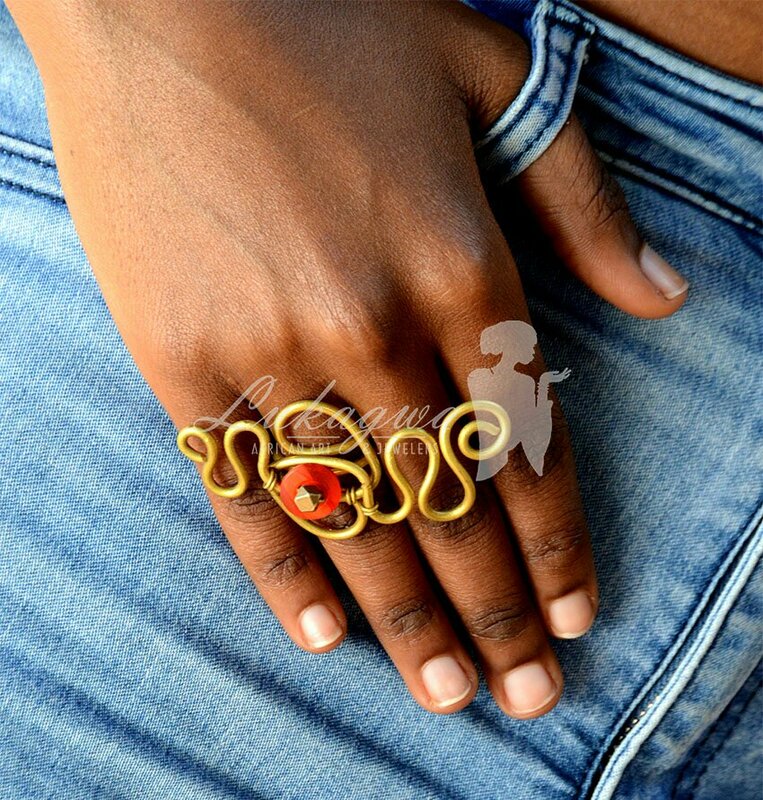 It’s best to wear one bold statement ring on one hand and that is enough to make your whole outfit stand out. Ensure that the color of your nail polish does not clash with the colors in your ring, and avoid wearing a bold and colorful ring with multi-colored manicures, nail art and glittery nail polish. While this may look cute, it does not exactly convey a statement of elegance. 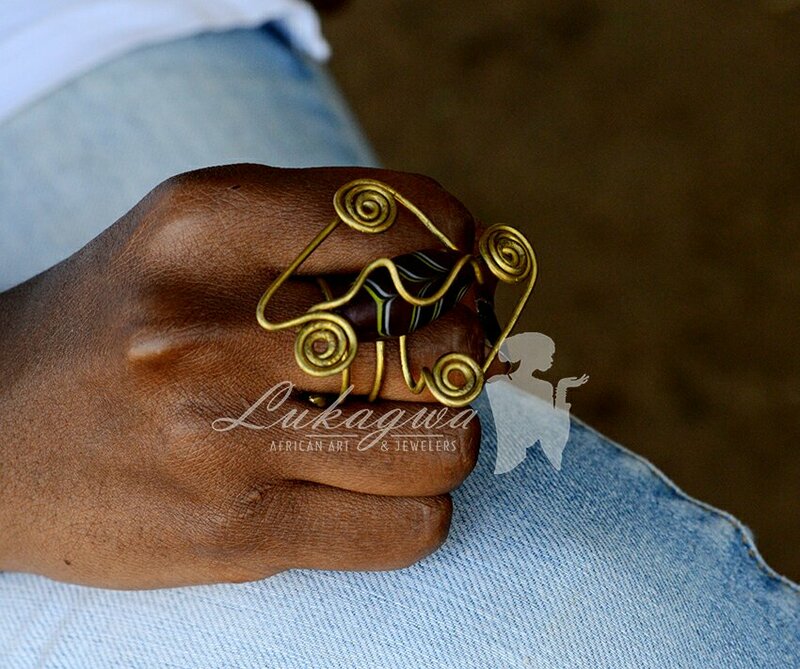 These eye-catching rings from Lukagwa are unique one of a kind art pieces, encapsulating the beauty of Africa and it’s culture. 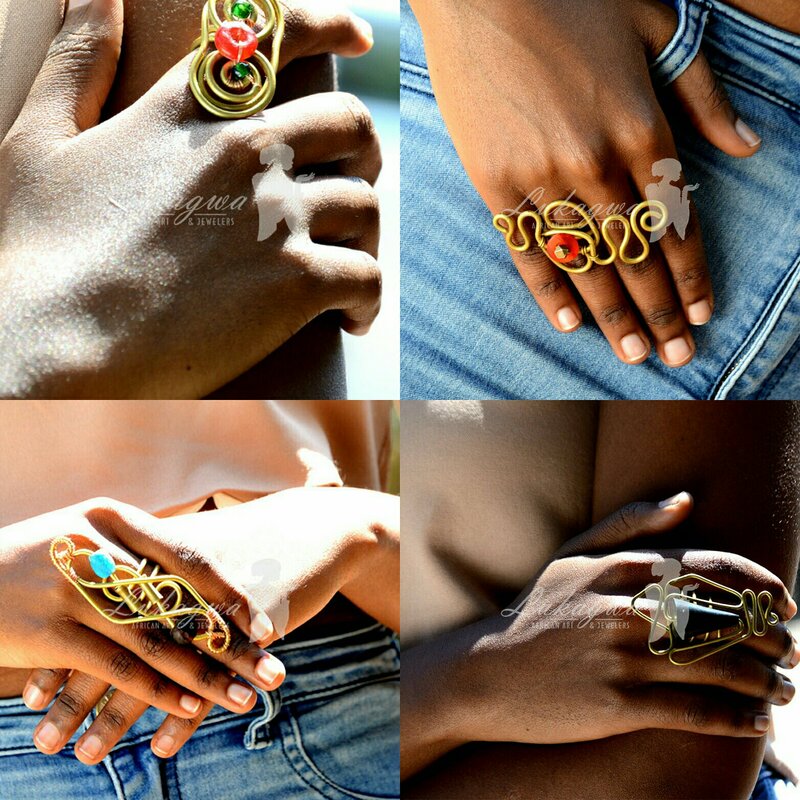 Buy yours now on www.etsy.com/shop/lukagwa. In case you missed out on our great Afrocentric handmade accessories to pimp your every day look. Capture the beauty and vitality of a summer garden with this gorgeous beaded ethnic bracelet. Pair it with your office outfit for extra glam. Feel free to inquire for size details. 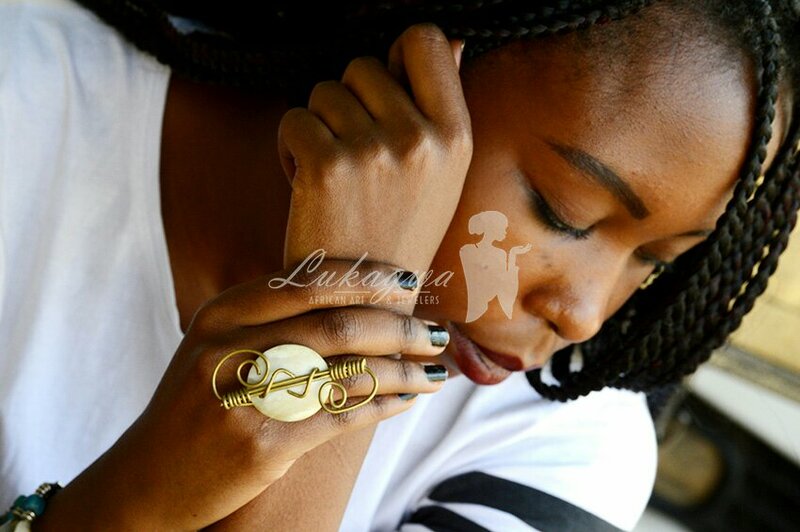 Adorn your hair with Lukagwa’s attractive collection of handmade African hair accessories. They do the job while making you look sophisticated and elegant. 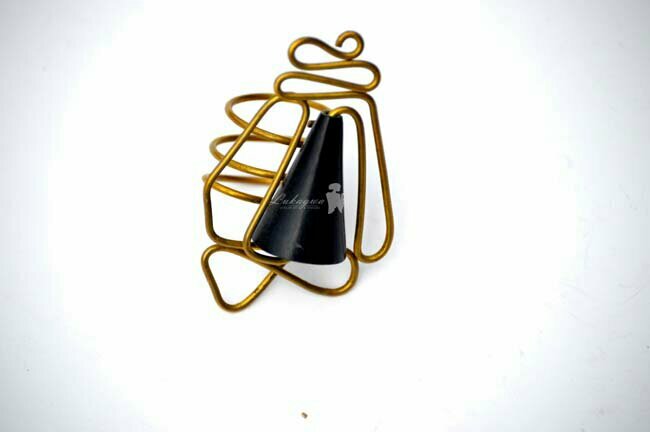 Each Brass ring features a one of a kind look designed to resonate with its owner’s personality.